Simply put, thread count is the number of individual vertical and horizontal threads in a square inch of fabric. Conventional wisdom says the higher the thread count, the more durable and luxurious the fabric. In the past, most cotton sheet sets featured thread counts of 200 or 300; today, however, it’s not uncommon to see thread counts of 600, 800, or even 1,000, especially among luxury brands. Unfortunately, however, high thread counts are more a marketing gimmick than a true indication of fabric quality. Here’s why: It’s impossible to fit more than about 400 threads into a square inch of fabric. Manufacturers are turning to gimmicks such as using a two-ply or four-ply thread and then multiplying it by actual thread count. So your 800 thread count sheet is actually either a 400-count two-ply thread or a 200-count four-ply thread. If you are buying cotton sheets, understand the lingo. For example, a sheet labeled 100 percent cotton is likely made of short fiber cotton, which is less durable and soft. Sheets made from short-fiber cotton will always pill faster, fade, and grow coarser over time, no matter how high the thread count. Look for Egyptian cotton, Pima, or Supima cottons, which are made of extra-long staple (ELS) length; they are breathable, more durable, and softer even after multiple launderings. While many people consider cotton percale, the most common weave, to be the only choice in bedding, there are actually many other options that offer a comfortable night’s sleep. Cotton sateen, for example, has a broader weave, giving sheets a satin-like finish and a rich luster. Cotton poplin is a feather-weight weave perfect for hot summer nights. Some prefer the drape and softness of cotton jersey knits, while others prefer a cotton flannel for cold winter nights. 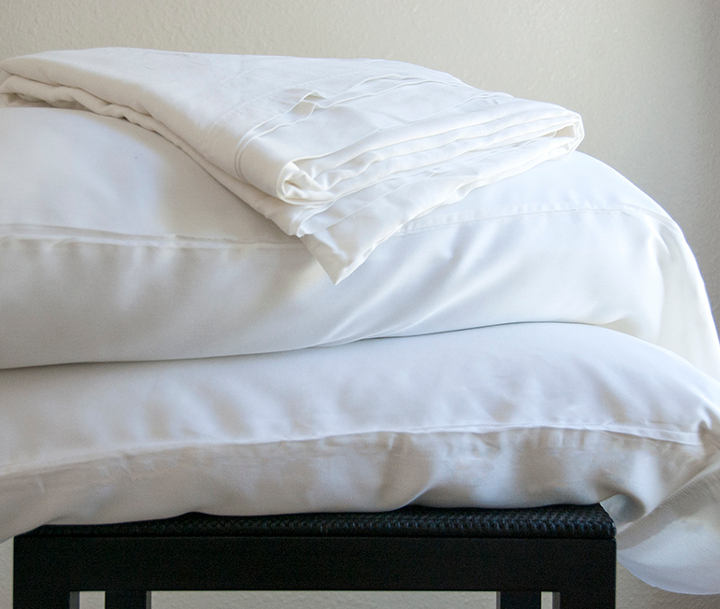 If you are sensitive to chemicals and dyes, or just prefer a more eco-friendly bedding option, look for sheet sets made with organic cotton. Traditional cotton is treated with a lot of pesticides and fungicides throughout its growth cycle; many other chemicals are used in bleaching, dyeing, and finishing cotton fabrics. If you purchase sheets labeled “wrinkle free” or “wrinkle resistant,” they’ve been treated with another dose of chemicals. Beds today come in more than just single, double, queen, and king; there are California-style mattresses, which are extra long, extra thick pillow top mattresses, and foam mattress toppers, which makes finding well-fitting sheets more complex. Be sure to check the dimensions of your fitted sheet against the length of your mattress, and look for deep pocket sheets if your mattress is more than about 12 inches thick. Wash your sheets in cool water and dry at a low temperature if the fit is tight; cotton laundered at high temperatures will shrink a bit. Buying new sheets doesn’t have to be complicated, especially if you understand the terminology. Once you know the material, thread count, and weave you like, you’re free to focus on the fun elements such as color, pattern, and style.